Roasting radishes brings out all the best adjectives. I don’t know about you, but I love radishes. LOVE them. I like them raw, sliced over baguette with fresh, homemade butter and fresh-ground black pepper; I like them quickly pickled in a little bit of rice vinegar with sugar and hot red pepper flakes. I like them in salads, in egg salad and tuna salad sandwiches, and whole, eaten like miniature apples, each bite dipped in sea salt. I like them in bruschetta. 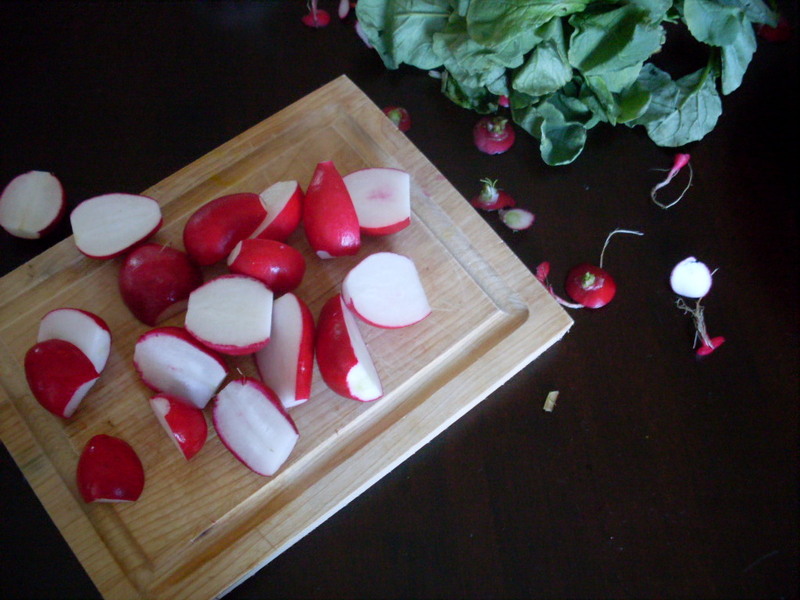 There is no way that I won’t eat radishes. I love their peppery blitz on my tongue, the way they are so bright and crisp and wet, such a perfect red byproduct of water and earth. Nick is more reluctant, and doesn’t love them like I do. He’s okay with my radishy urges, but doesn’t embrace them significantly, or even properly. I’ve never seen him pick radishes up when shopping. I’ve never caught him popping them into his mouth, as if secretly, in those quiet minutes before tooth-brushing, cat-feeding, and bedtime. I doubt he even dreams about them. But this is not about Nick’s shortcomings as an eater. I am certain that one day, I’ll find him crouched over the crisper, teary-eyed at the way the radishes look beside the lettuces and lemons. One day, he will look at food the way he looks at video games. Tonight we got a little closer to that day, and it was radishes that pushed him. He asked for seconds. 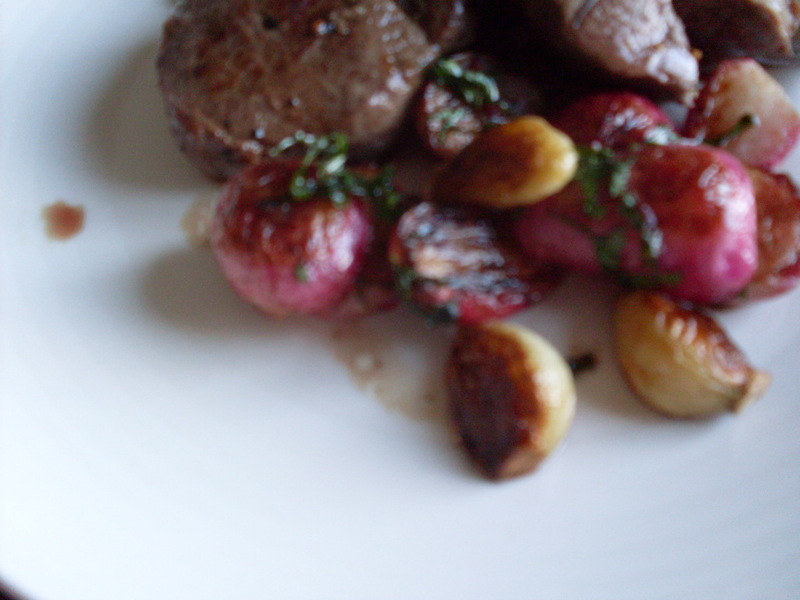 We had a couple of small pieces of venison for dinner (the second last package of venison remaining in my freezer from last fall’s hunt), but the main event was radishes, roasted with whole cloves of garlic and tossed with a pinch of fresh parsley and the gentlest squish of lemon to ever occur in my kitchen. 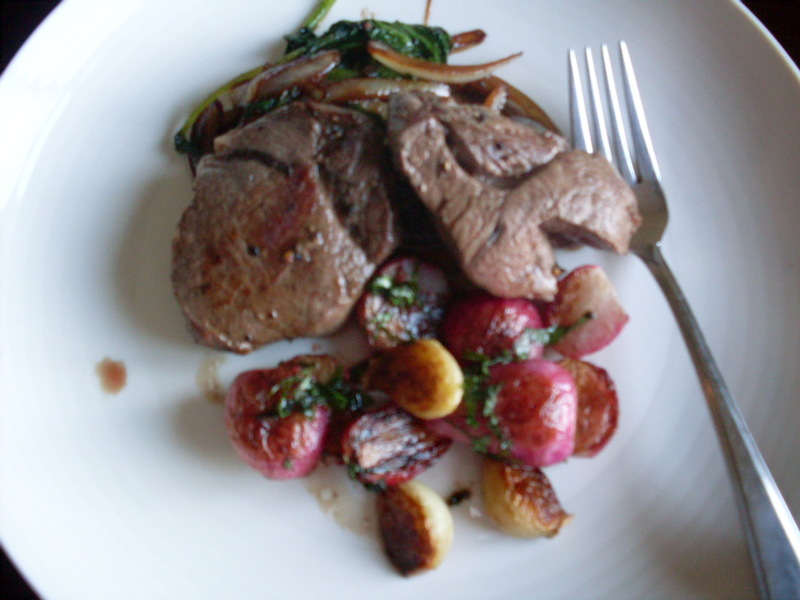 The radish greens were tossed in with browned onions during the last minutes of their fast caramelization in the meat juices and cooking fat. There was so much black pepper! Nothing went to waste. And it was efficient – dinner was on the table within twenty minutes. If you’ve never roasted radishes, once you do this will probably be the way you’ll come to love them most, if you don’t already adore them irrationally. Just a quick sear in a dash of oil in a pan over high heat, then into the oven for 15 minutes, and that’s it. Toss with herbs and pepper and lemon and salt, if you feel like it. That’s it, really, but here’s the recipe anyway. Make them tonight? Trim each radish, top and bottom, removing the root and top. 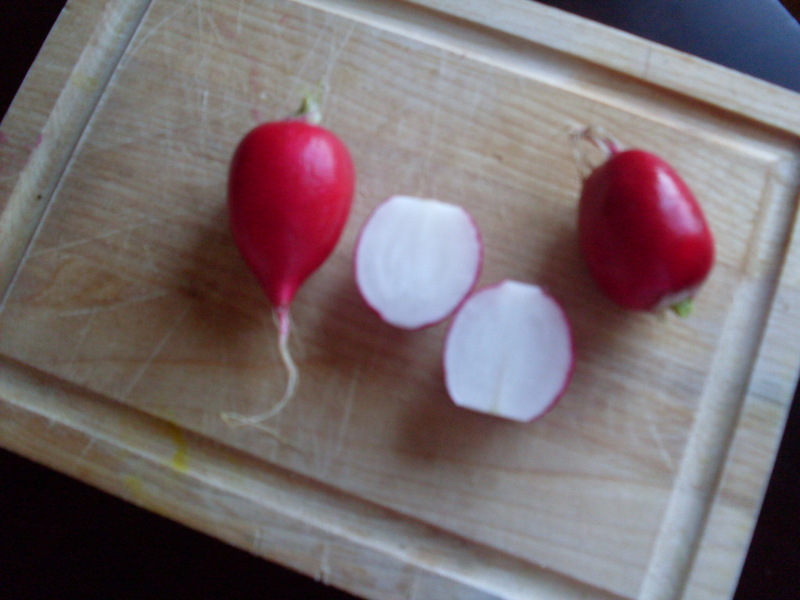 Slice in half lengthwise, if your radishes are of average radish size, or in quarters if they are very large. Peel garlic, and trim the tough ends off if necessary. In a sauté pan that you can use on the stove-top and in the oven, over high heat, heat olive oil. Add radishes and cook quickly, no more than a minute per side. Add whole cloves of garlic, and put into the oven, uncovered. 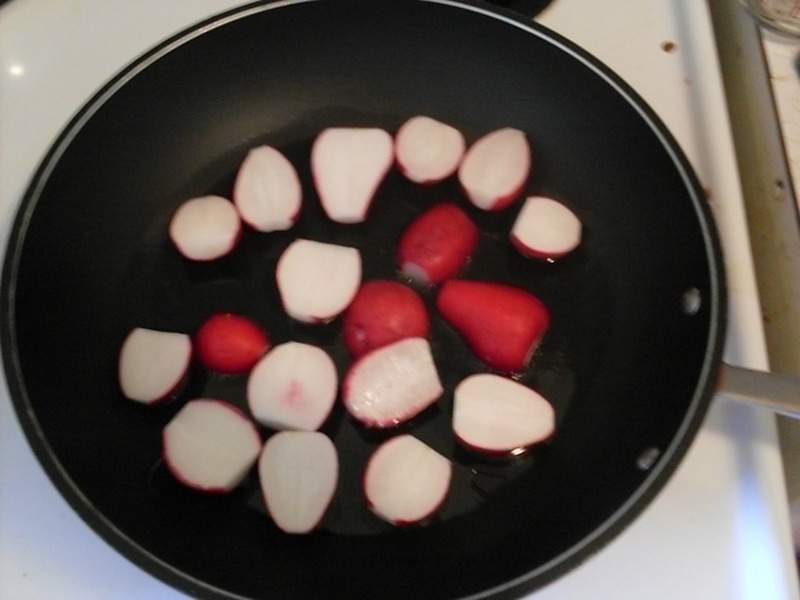 Cook for 15 to 18 minutes, turning radishes and garlic each once halfway through cooking. Both sides should turn a deep golden brown. Toss radishes and garlic with herbs, lemon juice, and salt, and serve immediately. Take a blurry picture, then eat. They turn sweet, almost buttery. They lose their peppery taste, but take on something different – still bright and springy, but a little more subtle, and silky on the tongue. They are very good as they are (with meat and their sautéed greens), or mushed up with soft cheese on fresh bread. Like cooking cucumbers, this is the kind of thing that everyone should know about by now but for some reason doesn’t. But you do now! Now there’s no excuse. Enjoy! < Previous Beurre blanc: A tasty conclusion to a very good day. Next > Sometimes there just aren’t words. Fortunately, there are always blurry photos.